Create with Gwen: Free Gift to you! Happy Birthday to Paper Pumpkin! Free Gift to you! Happy Birthday to Paper Pumpkin! It’s Stampin' Up! 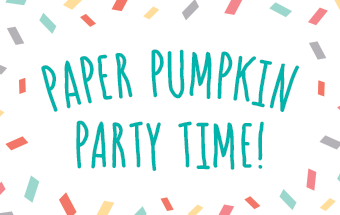 Paper Pumpkin's 4th Birthday and we are celebrating by giving subscribers a present! Your Welcome! A big surprise in April's kit! It was inspired and designed by Stampin’ Up! CEO, Sara Douglass! “bold, vibrant, and artistic, with a little bit of sass,” which is exactly how she described the kit. Sara designed this kit for us, so we can discover creativity through the eyes of our CEO while having an experience that is uniquely YOU! Oh, that Sara, she's a hoot! A subscriber? YAY! Never subscribed or stopped your subscription? Get in on this special kit! 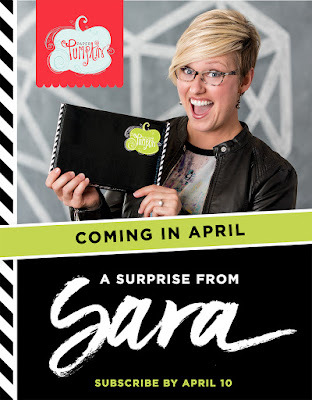 Must subscribe HERE by April 10 to receive April's Paper Pumpkin Kit! Try it for a month, then keep going or cancel! Win-Win! Don’t have to cut cardstock or pull supplies together…just skip to the FUN with a surprise gift included in the April kit! It’s a great time for new subscribers to join, past subscribers to come back, and for current subscribers to up their kit quantity...and yes, I did! Can't help myself! Embrace your inner artist and Join the Party! All my local subscribers are invited to Create Happy Studio to play with our kits together! 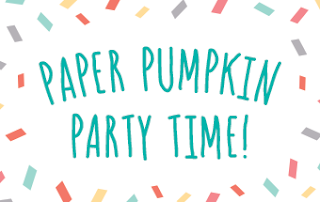 with a Paper Pumpkin event. *Convenience of an all-inclusive kit arriving at your door. *Exclusive photopolymer stamp sets to build a collection. *Crafting time you can count on without a lot of prep work. Contact me asap or subscribe by April 10 online HERE! Want a hard copy of any current catalog in your hands? contact me and I'll send you one!